A Recompense for the Dardanelles is a letter written by Arthur Conan Doyle first published in The Times on 25 october 1923. 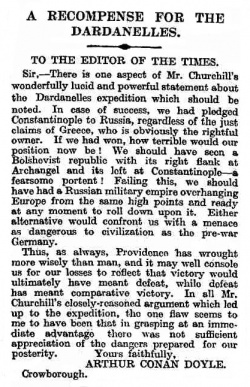 Sir, — There is one aspect of Mr. Churchill's wonderfully lucid and powerful statement about the Dardanelles expedition which should be noted. In case of success, we had pledged Constantinople to Russia, regardless of the just claims of Greece, who is obviously the rightful owner. If we had won, how terrible would our position now be! We should have seen a Bolshevist republic with its right flank at Archangel and its left at Constantinople — a fearsome portent! Failing this, we should have had a Russian military empire overhanging Europe from the same high points and ready at any moment to roll down upon it. Either alternative would confront us with a menace as dangerous to civilisation as the pre-war Germany. Thus, as always, Providence has wrought more wisely than man, and it may well console us for our losses to reflect that victory would ultimately have meant defeat, while defeat has meant comparative victory. In all Mr. Churchill's closely-reasoned argument which led up to the expedition, the one flaw seems to me to have been that in grasping at an immediate advantage there was not sufficient appreciation of the dangers prepared for our posterity. This page was last edited on 23 July 2017, at 00:11.